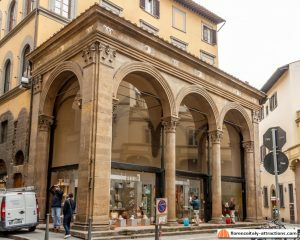 You could easily walk in via Della Vigna Nuova in Florence Italy without noticing Palazzo Rucellai, one of the greatest examples of civil architecture of the Renaissance and one of the hidden gems of Florence. The fact is, travelers come to Florence in the hope to see many examples of Renaissance art and architecture. While Florence is filled with Renaissance art, when it comes to architecture you will actually find that Florence is mainly a Medieval city. All the most important buildings like Ponte Vecchio, Palazzo Vecchio, the Duomo, the Santa Croce and Santa Maria Novella churches, have been built well before the Renaissance. 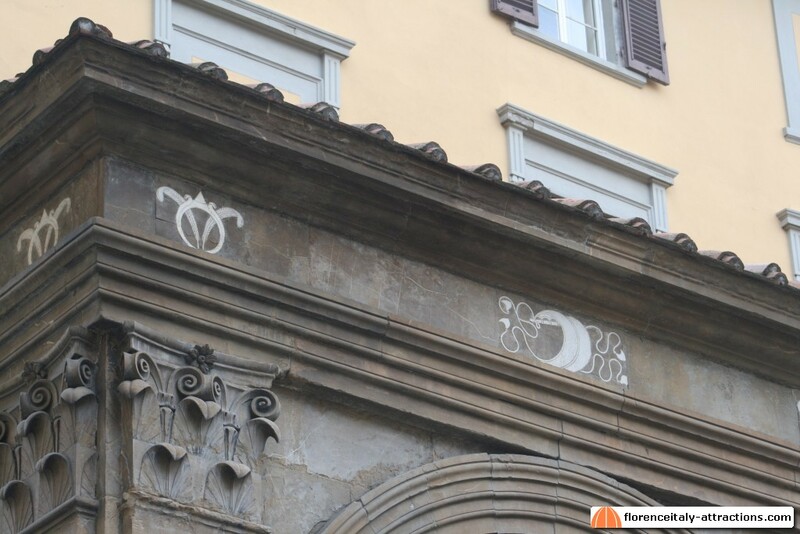 So where is the Renaissance architecture in Florence? We have the Basilica di San Lorenzo, the Basilica di Santo Spirito and… many private palaces: the city that was the largest in Europe in the late Middle Ages, after being hit by the black death was a lot smaller and didn’t need more public buildings. 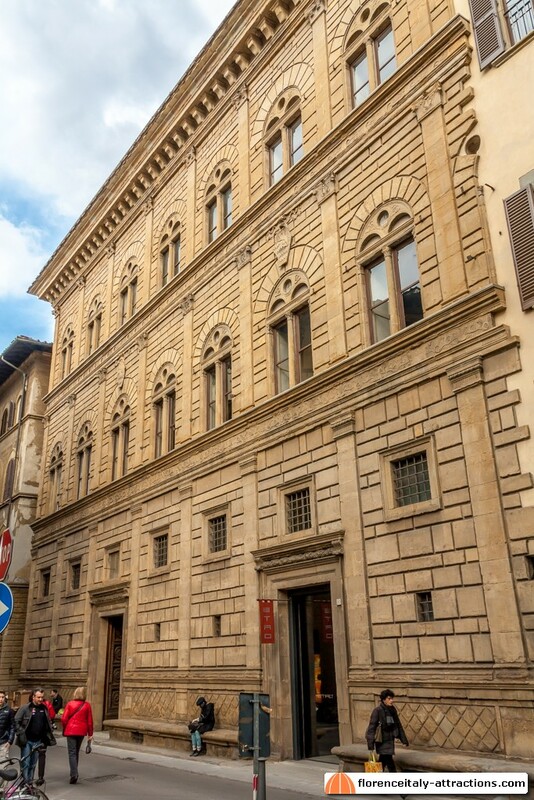 Of all the private palaces built in the 15th century Renaissance Florence, Palazzo Medici is the first in chronological order, but should you check a list of features of the typical Renaissance palace, the only one in Florence that has them all is Palazzo Rucellai. Giovanni Rucellai was one of the richest merchants in Florence Italy during the rise of the Medici family. It was in the same years as when Cosimo the Elder started the construction of Palazzo Medici that Giovanni Rucellai involved Leon Battista Alberti in the design of the new palace for his family, a building that actually existed; this means the intervention of the architect consisted of a modification of the existing architecture; a work which in this case was much constrained by the urban regulation that already existed in Florence at that time. The urban block belonging to the Rucellai family was enriched by Giovanni Rucellai purchasing more properties and the space for a loggia. The design was prepared and the palace built between 1446 and 1451. As any Renaissance palace, Palazzo Rucellai is made of three floors. 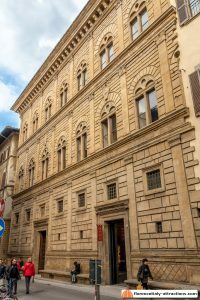 Unlike in the Medici Palace, the bugnato (rusticated ashlar: in other words, the stones projecting on the street) is less emphasized, also because the street is narrow. As you climb, the height of the floors decreases. 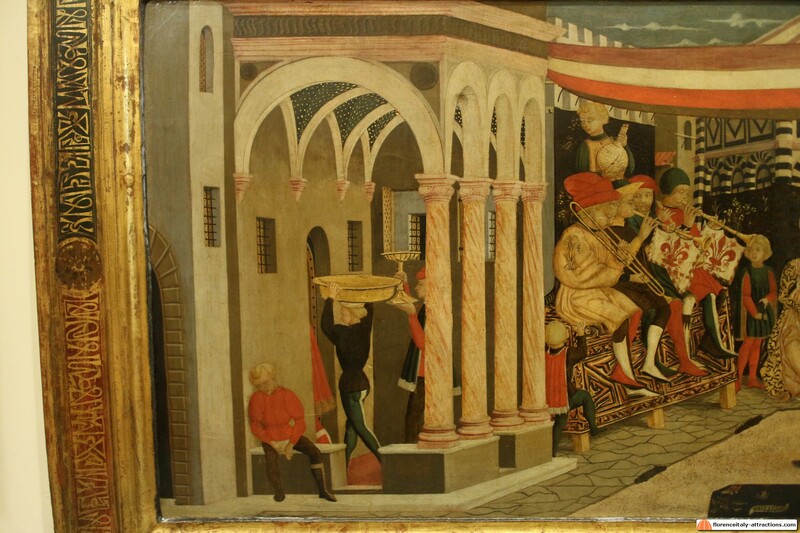 At the base of the construction is the bench, also visible in other Renaissance palaces like Palazzo Medici or Palazzo Strozzi: it was where common people sat down, waiting to ask a favor to the rich family: favors were the main system used to maintain political consensus, in a city where politics and business were inextricably connected. The Loggia is separated from Palazzo Rucellai (today it hosts a shop): once it was a typical element of the Renaissance palace, even Palazzo Medici had one that was closed later. 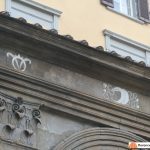 The frieze on the loggia features the symbols of both the Rucellai and Medici families: the sail was the personal symbol of Giovanni Rucellai, while the three feathers were the symbol of Piero de Medici “the Gouty”. It was politically convenient to show your appreciation for the Medici rulers, but it was also a way to celebrate the marriage of Bernardo, son of Giovanni Rucellai, with Lucrezia de Medici, daughter of Piero and sister of Lorenzo the Magnificent. The loggia was indeed the place where rich families celebrated important events, like a marriage, a birth or a baptism. 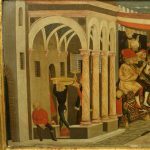 We have direct evidence of this in a work of art at the Accademia Gallery, the Cassone Adimari, representing a wedding party held in a loggia. The loggia is the element that more reflects the social rebirth of Florence during the Renaissance. Right before the black death, Florence was a city made of tower-houses, sort of castles with no door (you needed a ladder to enter) and few windows as narrow as possible. Now the palace and, by consequence, the family, are open to the outside: Renaissance palaces have large doors and many large windows; the loggia shows us how the most important families had a desire to publicly celebrate important events, in a new mood made of optimism for the future.